Police have arrested five people over the devastating dam collapse in Minas Gerais, Brazil that killed at least 65 people, with nearly 300 still missing. Three of those arrested work for Vale, the mining company that owned and operated the dam. The other two worked for a German company that carried out inspections on the dam last year. Attorney General Andre Mendonca said Vale is responsible for the disaster, the second of its kind in three years involving the mining company. Authorities called the 2015 Mariana dam collapse the worst environmental disaster in the country’s history. That collapse killed 19 people and wreaked havoc on the environment, leading mining company Samarco — a joint venture between Vale and BHP Billiton — to reach a deal in 2016 with the Brazilian government to pay up to $6.2 billion. In a video over the weekend, Vale chief Fabio Schvartsman called the Brumadinho dam break “inexcusable” and asked the Brazilian public for forgiveness. He said the company will aid victims and noted that Vale put “immense effort” into improving its dams after the disaster in Mariana. Soon after the most recent collapse, the state judiciary froze more than $260 million from Vale, with a presiding judge citing the company’s responsibility for the disaster. The money will be deposited into a judicial account to compensate for any costs to the state as a result of rescue operations or victim support. 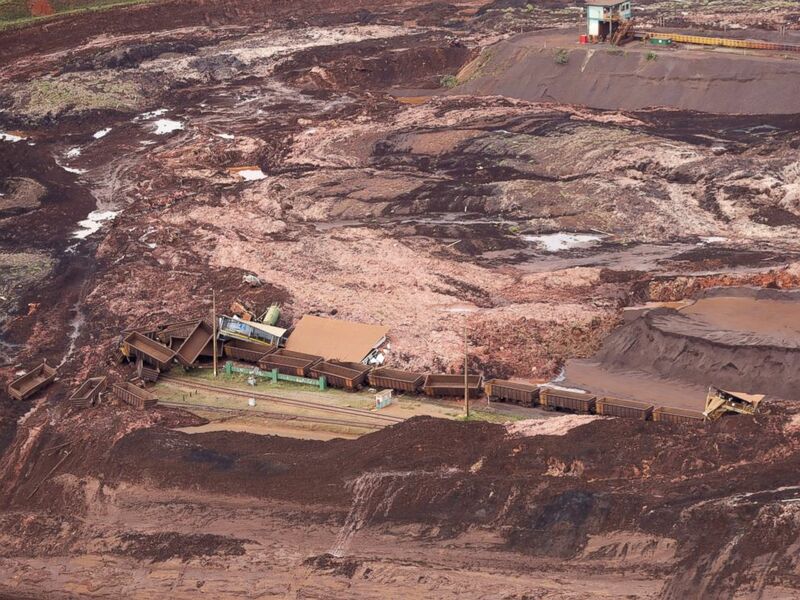 Minas Gerais state has fined Vale $99 million for damage caused by the dam break and said the money will be used for repairs. The Civil Defense of Minas Gerais said 291 people were still missing and 192 people have been rescued from the area. Authorities say 427 people were in the Córrego do Feijão mine in the southeastern state of Minas Gerais when the dam burst. Hundreds of people are still missing and the collapse buried most of the mining town-Brumadinho. The disaster shed light on potential risks at nearly 700 other mining dams in the state of Minas Gerais and drew attention to what some described as a lack of appropriate regulation. The collapse unleashed a muddy sea of mining debris into the region and the extent of the damage is still being calculated. Authorities temporarily halted search and rescue and placed 3,000 people under evacuation orders amid fears that another dam nearby was about to rupture. The orders were lifted after authorities determined dam VI was no longer at risk of bursting. In an effort to find missing people, the Federal Attorney General’s Office obtained an injunction in the Federal Court of Minas Gerais ruling that mobile carriers should provide data from the cell phone signals of people who were in the region where the dam broke. Officials say they expect to contain the sludgy mine waste known as tailings within two days. The Brazilian National Water Agency said they are monitoring the tailings and coordinating plans for supplying water to the affected region. Officials said during a press conference that the priority now is assisting victims and their families. After that, officials said they’d focus on environmental damage and the mining process. Several videos circulating of the disaster show the devastation of the dam collapse. One video shows the exact moment the dam collapsed, sending a sea of mud and debris swallowing up the area as unsuspecting cars are scene, likely for the last time. Videos of the rescue efforts show helicopters hovering feet above the ground as firefighters’ pluck people from the muck.